Gunmen ambushed a bus in a predominantly Sunni neighborhood in Baghdad on Monday, killing seven people, police said. The attack occurred in the western neighborhood of Amariyah in western Baghdad, as sectarian tensions rose following a rampage by Shiite gunmen killed 41 people, most of them Sunnis. The gunmen killed all six passengers, including a woman, and the driver before setting the bus on fire, police Capt. Jamil Hussein said. Meanwhile, two car bombs struck a Shiite district in Baghdad on Monday, killing at least eight people and wounding dozens, officials said, as sectarian tensions rose following a rampage by Shiite gunmen killed 41 people, most of them Sunnis. The violence began when a car parked near a repair shop on the edge of the Shiite slum of Sadr City blew up, followed within minutes by a suicide car bomber who drove into the crowd that had gathered near the site. Hospital officials said at least eight people were killed and 41 wounded in the blast. AP Television News footage showed the devastated repair shop with a crumpled roof and the blackened hulks of cars on the street outside. A roadside bomb also struck a police patrol near a restaurant elsewhere in eastern Baghdad, wounding three policemen, police Lt. Ahmed Qassim said. And a bomb exploded in the Shurja market in central Baghdad, killing three people and wounding 18, police Col. Adnan al-Obeidi said. In Kirkuk, a suicide truck bomb struck an office of the Patriotic Union of Kurdistan, one of the main Kurdish political parties in Iraq, killing five people and wounding 12 others, police Brig. Sarhat Qadir said. A police patrol in the predominantly Shiite city of Hillah, about 60 miles south of Baghdad, also hit a roadside bomb, leaving one policeman dead and four wounded, army Capt. Hassim al-Khafaji said. The defense began closing arguments in the trial of Saddam Hussein on Monday, but most of the lawyers boycotted the court after the slaying of one of the former Iraqi leader's laywers last month. Meanwhile, CBS News correspondent Lee Cowan reports that U.S. experts have found powerful forensic evidence for the prosecution (video). In Iraq, a fake ID could be the difference between life and death. The trade in bogus identification cards is booming since Sunnis and Shiites alike try to hide their heritage behind a different surname – and protect themselves from sectarian assault. Gunmen forced a doctor out of his car in western Baghdad on Monday and killed him in front of his family. A bomb struck a gas station in Mahmoudiya, south of Baghdad, wounding 10 people Monday. Two bullet-riddled bodies were found in western Baghdad Monday. Police found five unidentified bodies in Suwayrah, 25 miles south of Baghdad. And the bodies of five men, including one whose mother was a former member of the ousted Baath Party and a policeman, also were found in Kut, 100 miles southeast of the capital Monday. In the western city of Ramadi, a car bomb exploded next to a U.S. convoy, wounding four American soldiers, the military said. The attack occurred as the convoy headed to the government center in the city, an insurgent hotbed 70 miles west of Baghdad. The streets in the western Baghdad neighborhood of Jihad were calm on Monday after the deadly rampage the day before by Shiite gunmen, who dragged Sunnis from their cars, picked them out on the street and killed them. Police said 41 people were killed, although there were conflicting figures that went as low as nine. Some Sunni clerics put the death toll at more than 50 in Jihad, a once prosperous neighborhood of handsome villas owned by officials of Saddam Hussein's security services. As CBS News correspondent Lee Cowan reports, the killings took place in an area of Baghdad so dangerous that the closest most reporters could get was the hospital — where those lucky enough to survive told a miserable tale. Sunni leaders expressed outrage over the killings, and President Jalal Talabani, a Kurd, appealed for calm, warning that the nation stood "in front of a dangerous precipice." Ayad al-Samaraie, a member of the Iraqi Accordance Front, the largest Sunni bloc in parliament, blamed members of radical Shiite cleric Muqtada al-Sadr's Mahdi Army militia for Sunday's killings. He also called on the U.N. Security Council to send peacekeepers to Iraq, saying Monday that U.S.-led "occupation forces" cannot protect Iraqis. The head of the bloc Adnan al-Dulaimi also called on the Shiite-led government to stop the militias from carrying out violence. "The gangs want to pave the way for sectarian strife," he told reporters. "The attacking of Sunnis in Jihad and other places in Baghdad is aimed at weakening the Sunnis and driving them from Baghdad." Al-Sadr denied responsibility Sunday and called on both Shiites and Sunnis to "join hands for the sake of Iraq's independence and stability." He assured Vice President Tariq al-Hashimi, leader of the largest Sunni Arab party, that he would punish any of his militiamen if they were involved. The surge in violence was likely to further enflame Shiite-Sunni tensions and undermine public confidence in Iraq's new unity government. 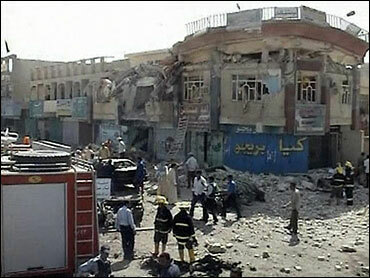 It also raised new questions about the effectiveness of the Iraqi police and army to curb such attacks. Several carloads of gunmen drove into the Jihad area, stopping cars, checking passengers' identification cards and shooting to death those with Sunni names. Masked gunmen wearing black clothes roamed the streets, abducting Sunnis whose bodies were found later scattered throughout the religiously mixed neighborhood, an Interior Ministry official said. He spoke on condition of anonymity because he was not authorized to talk to media. Residents contacted by telephone told of gunmen systematically rounding up and massacring Sunni men. A Shiite shopkeeper said he saw heavily armed men pull four people out of a car, blindfold them and force them to stand to the side while they grabbed five others out of a minivan. "After ten minutes, the gunmen took the nine people to a place a few meters away from the market and opened fire on them," Saad Jawad al-Azzawi said. Prime Minister Nouri al-Maliki, a Shiite, has promised to disband Shiite militias and other armed groups, which are blamed for much of the sectarian violence, but they have flourished in large part because of the inability of the police, the Iraqi army and coalition forces to guarantee security.